This article was originally published by Kiu Tay-Teo, PhD, André Ilbawi, MD, and Suzanne R. Hill, PhD in JAMA Netw Open. 2019;2(1):e186875. under the terms of the CC-BY License. Question How does income from the sales of cancer drugs compare with the costs of research and development? Findings In this observational study of 99 cancer drugs approved by the FDA from 1989 to 2017, the median income return by the end of 2017 was found to be $14.50 (range, $3.30-$55.10) for every $1 research and development spending. Many drugs, particularly biologics, continued to generate high-sales incomes for the originator companies after expiry of patents and exclusive marketing rights. Meaning Cancer drugs, through high prices, have generated incomes for the companies far in excess of research and development costs; lowering prices of cancer drugs and facilitating greater competition are essential for improving patient access, health system’s financial sustainability, and future innovation. Importance High costs and risks of research and development (R&D) have been used to justify the high prices of cancer drugs. However, what the return on R&D investment is, and by extension what a justifiable price might be, is unclear. Objective To compare incomes from the sales of cancer drugs with the estimated R&D costs. Design, Setting, and Participants This observational study used global pharmaceutical industry sales data to quantify the cumulative incomes generated from the sales of cancer drugs for companies that have held patents or marketing rights (originator companies). All cancer drugs approved by the US Food and Drug Administration from 1989 to 2017 were identified from the United States Food and Drug Administration’s website and literature. Itemized product sales data were extracted from the originator companies’ consolidated financial reports. For drugs with data missing in specific years, additional data was sought from other public sources, or where necessary, estimated values from known reported values. Drugs were excluded if there were missing data for half or more of the years since approval. Data analysis was conducted from May 2018 to October 2018. Main Outcomes and Measures Sales data were expressed in 2017 US dollars with adjustments for inflation. Cumulative incomes from the sales of these drugs were compared against the R&D costs estimated in the literature, which had been adjusted for the costs of capital and trial failure (risk adjusted). Results Of the 156 US Food and Drug Administration–approved cancer drugs identified, 99 drugs (63.5%) had data for more than half of the years since approval and were included in the analysis. There was a median of 10 years (range, 1-28 years) of sales data with 1040 data points, 79 (7.6%) of which were estimated. Compared with the total risk-adjusted R&D cost of $794 million (range, $2827-$219 million) per medicine estimated in the literature, by the end of 2017, the median cumulative sales income was $14.50 (range, $3.30-$55.10) per dollar invested for R&D. Median time to fully recover the maximum possible risk-adjusted cost of R&D ($2827 million) was 5 years (range, 2-10 years; n = 56). Cancer drugs continued to generate billion-dollar returns for the originator companies after the end-of-market exclusivity, particularly for biologics. Conclusions and Relevance Cancer drugs, through high prices, have generated returns for the originator companies far in excess of possible R&D costs. Lowering prices of cancer drugs and facilitating greater competition are essential for improving patient access, health system’s financial sustainability, and future innovation. The costs of research and development (R&D) for drugs has been a recurrent point of discussion in the continuing debate about high prices of drugs. Most recently, the Trump administration’s Blueprint to Lower Drug Prices and Reduce Out-of-Pocket Costs argues that foreign countries “Are not paying an appropriate share of the necessary research and development to bring innovative drugs to the market,”1 implying a direct association between the costs of R&D and drug prices. In addition to covering R&D costs, high drug prices are also justified on the basis that financial return needs to be sufficiently high to incentivize and finance the R&D of new drugs.8 The industry has claimed that 20% of its revenues were reinvested into R&D.9 However, previous studies have found that the financial returns of some cancer drugs (eg, imatinib and enzalutamide) were more than sufficient to cover past R&D expenses for the originator companies and generate generous profit to incentivize future R&D.6,10,11 A systematic analysis of the return on R&D investment for cancer drugs has not yet been conducted, to our knowledge, and can inform a discussion on what a justifiable price could be. To this end, we undertook this study to quantify the income generated from the sales (ie, sales income net of rebates and discounts but without accounting for expenses and taxes) of cancer drugs for the pharmaceutical companies that have held patents or marketing rights (ie, originator companies). This study was conducted to quantify the reported global incomes from the sales of individual drugs approved by the US Food and Drug Administration (FDA) between 1989 and 2017 for the treatment and prevention of hematological cancers, solid tumors, and related conditions such as neutropenia and hypercalcemia (cancer drugs). We identified all drugs approved by the FDA between 1989 and 2017 for any cancer-related indications from the FDA website12 and published literature.13 We then retrieved consolidated annual financial reports from websites of the originator companies of the identified drugs. Where companies’ annual reports were unavailable, we retrieved annual filing of financial statements (ie, forms 10-K or 20-F) from the database of US Securities and Exchange Commission14 or other websites (eg, http://getfilings.com). We extracted itemized annual sales data for each cancer drug from the year of FDA approval to 2017. Where there was a transfer of marketing rights between companies, or comarketing and copromotion agreements, sales data from all companies involved were sought from their respective annual reports for cross validation. Where required, we also sought data from journal articles and gray literature, identified through searches on web search engine (ie, Google) using nonspecific search terms: the brand and generic name, year, and name of the company. Only literature in English was included. For missing sales data in specific years owing to nonreporting or nonavailability of documents, we first estimated the sales of a drug according to the growth rate documented in the annual report for that drug in the following year. For the years without any publicly available information based on the above search method, we applied exponential interpolation between 2 known values. For products that have past the period of market exclusivity and were known to have remained in the originator companies’ portfolios, we applied exponential decay to estimate missing data. If data were missing for more than half of the years since approval, we excluded the product from the analysis. Sales data reported in British Pound, Euro, Japanese Yen, and Swiss Franc were converted to US dollars based on published currency exchange rates in the corresponding individual years.15 The reported sales data were adjusted to 2017 value according to the annual world’s percentage inflation in consumer prices.16 This is conservative because the rates were lower than the rates used for calculating capital costs of R&D in most years during the observation period (at 7%6 and 10.5%4). We compared the cumulative income from the sales of the cancer drugs with the estimated median and range of risk-adjusted R&D costs in 2017 value. All analyses and data visualization were performed in Excel 2010 (Microsoft). A subset of drugs have on-label noncancer indications, eg, rituximab has an approved indication for rheumatoid arthritis. Specific sales data were obtained for cancer indications through different brand names (eg, zaltrap [ziv-aflibercept] and eylea [aflibercept]) or when the sales data were presented separately for oncology indications (eg, rituximab). For simplicity, we did not make adjustments in the base-case analysis for data that could not be disaggregated to the cancer-specific proportion. Instead, the results were presented with notes about the drugs’ noncancer indications where relevant. Sensitivity analyses were performed by incorporating the costs associated with additional postapproval randomized clinical trials for possible extension of indications or dosage forms. The financial costs of 1 Phase I, Phase II, and Phase III trial in oncology have been estimated as $4.5 million, $11.2 million, and $22.1 million, respectively, in 201417 (or $4.6 million, $11.5 million, and $22.8 million, respectively, in 2017 dollars). In addition, sensitivity analyses were conducted by assuming twice the base-case R&D cost estimates (ie, median, $1588 million; range, $438 million-$5654 million) based on the observation that the mean cost of oncology drug pivotal trials was about 1.5 to 2 times higher than the costs of pivotal trials in other therapeutic areas (except cardiovascular).18 We also examined the mean income return on investment by including the R&D costs of 57 drugs excluded from the base-case analysis; in this sensitivity analysis, we assumed in the absence of robust data that these drugs would accrue, unrealistically, 0 revenue during the observation period. In 2017, median sales incomes across all drugs was $435.2 million (range, $1.8 million for topotecan to $8.2 billion for lenalidomide) (eTable in the Supplement). The mean annual sales income since the year of approval ranged between $3 million for Acalabrutinib (approved in October 2017) and $5.9 billion for bevacizumab (approved in February 2004). Thirty-three drugs (33.3%) were found to have mean annual sales income of more than $1 billion. Forty-nine cancer drugs (49.5%) had cumulative sales of more than $5.0 billion (Figure 1). At the end of 2017, 5 drugs had accrued sales incomes of more than $50 billion for the following originator companies: rituximab ($93.7 billion), trastuzumab ($88.2 billion), bevacizumab ($83.4 billion), pegfilgrastim ($64.0 billion), and imatinib ($63.8 billion) (Figure 2). Rituximab and trastuzumab had been available for about 20 years since approvals in 1997 and 1998 (by the FDA),20 while imatinib, pegfilgrastim, and bevacizumab received their first approval in 2001, 2002, and 2004,20 respectively. The reported incomes for bevacizumab included sales related to off-label use for macular degeneration of the eye, but income from this indication is likely to be low because of the smaller therapeutic dosage. Cumulative sales incomes were reported as US dollars in 2017 value. Many cancer drugs were found to have generated substantial financial returns for the originator companies after market exclusivity ended, particularly for biologics (Figure 2). For example, the principal patents taking filgrastim expired in August 2006 (Europe) and December 2013 (United States) following its launch in 1991.24 Although its income has declined following competition from biosimilar products, filgrastim continued to generate more than $500 million annually (range, $549-$1.2 billion) for the initial originator company after losing market exclusivity in 2014. The originator company of filgrastim also reported more than $4 billion in sales income annually from pegfilgrastim, whose principal patents expired in October 2015 (United States) and August 2017 (Europe).24 The reported annual sales incomes for anastrozole, bicalutamide, rituximab, trastuzumab, capecitabine, temozolomide, and thalidomide were also in the hundreds of millions of dollars for the originator companies following expiry of their principal patents. Based on a risk-adjusted R&D cost of $794 million ($2827 million-$219 million),6 by the end of 2017, $1 (risk-adjusted) invested for R&D of the 99 drugs had generated a median of $14.50 (range, $3.30-$55.10) in sales income for the originator companies. Assuming the upper threshold R&D cost of $2827 million, rituximab, trastuzumab, bevacizumab, pegfilgastim, and imatinib have brought in for the originator companies, $33.20, $31.20, $29.50, $22.60, and $22.60, respectively, for every risk-adjusted dollar that went into their R&D. By the end of 2017, the cumulative sales of 73 cancer drugs (73.7%) included in the analysis had fully recovered the median R&D costs of $794 million. If the assumed R&D costs were $2827 million and $219 million, 56 (56.6%) and 91 (91.9%) drugs, respectively, had at least generated incomes exceeding the R&D costs by the end of 2017 (Figure 3). The median time to generate sales income to fully cover risk-adjusted R&D cost of $794 million was 3 years (range, 2-5 years; n = 73). For the maximum estimated risk-adjusted cost of R&D ($2827million), the time to cost recovery was 5 years (range, 2-10 years; n = 56). 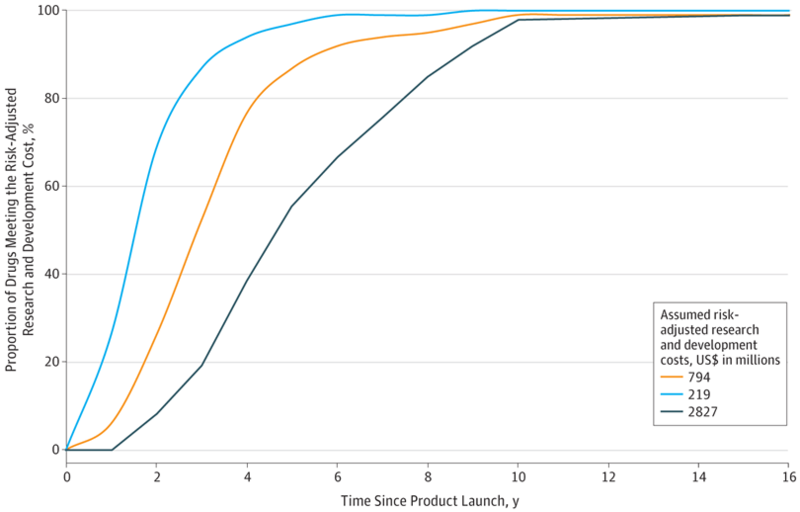 A threshold analysis found that 99% of the 45 cancer drugs with sales data 10 years from their first year of launch had generated incomes sufficient to at least offset the risk-adjusted R&D costs irrespective of the assumed threshold values for R&D costs (Figure 3). The median sales incomes were found to range from $11.40 to $13.80 for every dollar spent on R&D when the costs of up to 5 randomized clinical trials, for the extension of indications or development of additional dosage forms were incorporated (Table). The incomes remained at least 3 times higher than the estimated R&D costs for up to 5 postapproval trials, irrespective of whether the costs of phase I trials were incorporated. When the R&D costs for cancer drugs were assumed to be twice as high as the base-case estimates ($1588 million; range, $438 million-$5654 million), the median income return was $6.70 (range, $1.20-$27.10) per dollar invested for R&D. 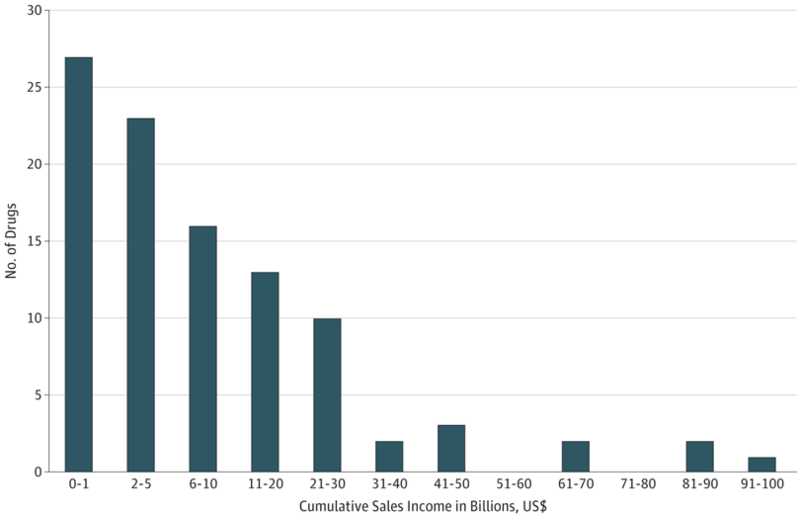 Finally, the median income, with accrual of R&D costs but with 0 sales incomes from the 57 drugs excluded from the base-case analysis, was found to be $8.80 (range, $1.70-$34.40) per R&D dollar. Despite the longstanding debates about the relationship between R&D costs and drug prices,25-27 to our knowledge, this is the first study that systematically quantified incomes from the sales of a comprehensive set of cancer drugs, over a long observation period, and compared with their estimated costs of R&D. The high incomes and supernormal returns would be less worrying if patients were able to access cancer drugs at affordable prices. However, the existing evidence suggests otherwise: access to cancer drugs globally remains low34,35 and the number of cancer drugs with annual costs at least in the tens of thousands is increasing fast.19,36,37 The resulting expenditure effects have compelled insurance schemes to exclude patients from coverage, restrict access, or impose high out-of-pocket costs.34,38-40 For these reasons, the high prices of cancer drugs have resulted in reduced capacity of health care systems to provide population-wide affordable access to cancer drugs. Our analysis has also shown that the returns from cancer drugs are much higher than what would be considered a justifiable return required for rewarding and incentivizing innovation, both in economic terms and by reasonableness. Our results and observations from other published studies suggest that the excessive returns might have contributed to inefficiencies in R&D of cancer drugs and stifled clinically meaningful innovation. 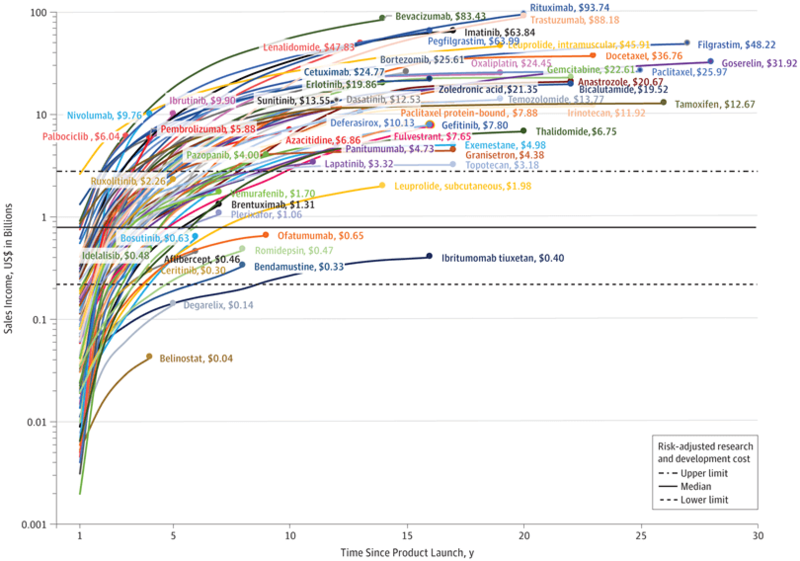 On inefficiencies in R&D of cancer drugs, leading experts in cancer research have observed considerable duplication of research effort (eg, checkpoint immune therapeutics).41-43 Companies seem to have adopted a derisking strategy by duplicating and pursuing marginal indications,41-43 with the expectation that the market would continue to bear the high prices irrespective of the magnitude of benefits in the name of innovation. A modeling study has shown that, hypothetically, a company might generate profit from running a clinical trials portfolio of chemically inert compounds by virtue of statistical probability.44 This is because of the high returns through high prices and the regulator’s willingness to grant approval based on a single randomized clinical trial with statistical significant results, even if the magnitude of benefit is marginal or is demonstrated through only surrogate end points.44 Over the longer term, such distortion of incentives and investment may stifle clinically meaningful innovation. This lack of clinically meaningful innovation among cancer drugs is corroborated by extant evidence. A number of studies note that R&D in the past decades has resulted in many drugs with limited evidence to support their clinical value.45-49 For example, of the 54 cancer drugs approved by the FDA from 2008 to 2012, only one-third have evidence that they prolong survival, and only 5 additional drugs were shown to lead to improved overall survival during the postmarketing period.48 For drugs that improve survival, the overall magnitude of benefit was often small: FDA-approved drugs for solid tumors from 2002 to 2014 were found to result in modest progression-free and overall survival gains of 2.5 months and 2.1 months, respectively.43 In addition, there have been concerns about the safety profile of newer drugs. A meta-analysis of FDA-approved cancer drugs from 2000 to 2010 showed that the risk of toxic death and treatment discontinuation were greater for newer targeted drugs than the comparator products.49 In short, while there are a high number of blockbuster cancer drugs, there are relatively fewer drugs with clinically meaningful benefits, supporting the view that the majority of R&D of cancer drugs to date has not generated true innovation. Furthermore, it could be argued that the returns from cancer drugs have been so high that they might have overincentivized the pharmaceutical industry to dedicate substantial, perhaps disproportionate level of investment toward the R&D of cancer drugs, possibly at the expense of research in other disease areas. Indeed, a review shows that there were 4006 randomized clinical trials for cancer drugs in 2017, representing about half of all pharmaceutical trials.50 This high level of investments suggests that companies must have deemed the highly favorable returns on investments for cancer drugs as more than sufficient to overcome their claims of higher investment risks due to higher R&D costs and failure and/or discontinuation rates of cancer drug trials. The considerable financial incentives might even have encouraged companies to take higher than normal risk in initiating expensive trials with low probability of success (eg, mitosis-targeting drug candidates43). This study has shown that cancer drugs, through their high prices, have generated substantial financial returns for the originator companies. Excessive returns on investment may distort R&D investment and stifle future clinically meaningful innovation, with evidence of such a trend having already emerged in the R&D of cancer drugs. High prices have restricted patient access to cancer drugs and compromised financial sustainability of health systems globally. For these reasons, actions must be performed to correct the unsustainable trend of drug prices, in cancer and other therapeutic areas. Author Contributions: Dr Tay-Teo had full access to all of the data in the study and takes responsibility for the integrity of the data and the accuracy of the data analysis. Concept and design: Tay-Teo, Hill. Acquisition, analysis, or interpretation of data: Tay-Teo, Ilbawi, Hill. Drafting of the manuscript: Tay-Teo. Critical revision of the manuscript for important intellectual content: Tay-Teo, Ilbawi, Hill. Administrative, technical, or material support: Tay-Teo, Ilbawi. Conflict of Interest Disclosures: Drs Tay-Teo, Ilbawi, and Hill reported being staff members of the World Health Organization. Dr Tay-Teo reported being an employee of Deloitte Access Economics, Australia, prior to July 2017 and prior to this study being conceived. No other disclosures were reported. Disclaimer: The conclusions in this article are the authors’ as individuals and do not represent the World Health Organization policy. Additional Contributions: Bernadette Cappello, MPH, and Nicola Magrini, MD, provided comments to an early draft. They are staff members of the World Health Organization and did not receive compensation in addition to their normal salary. US Department of Health and Human Services. American patients first—the Trump administration blueprint to lower drug prices and reduce out-of-pocket costs. https://www.hhs.gov/sites/default/files/AmericanPatientsFirst.pdf. Accessed May 21, 2018. Hay M, Thomas DW, Craighead JL, Economides C, Rosenthal J. Clinical development success rates for investigational drugs. Nat Biotechnol. 2014;32(1):40-51.
International Federation of Pharmaceutical Manufacturers and Associations. The pharmaceutical industry and global health: facts and figures 2017. https://www.ifpma.org/wp-content/uploads/2017/02/IFPMA-Facts-And-Figures-2017.pdf. Accessed November 29, 2018. Kirk K, Hamelmann L, Halawi F, Tindana P, Greenbaum S. Report of the United Nations Secretary-General’s High-Level Panel on Access to Medicines. Geneva, Switzerland: United Nations Secretary-General; 2016. Hirschler B. GlaxoSmithKline boss says new drugs can be cheaper. https://www.reuters.com/article/us-glaxosmithkline-prices/glaxosmithkline-boss-says-new-drugs-can-be-cheaper-idUSBRE92D0RM20130314. Accessed June 1, 2018. Pharmaceutical Research and Manufacturers of America. Prescription Medicines: Costs in Context. Washington, DC: Pharmaceutical Research and Manufacturers of America; 2017. US Food and Drug Administration. Hematology/oncology (cancer) approvals & safety notifications. http://wayback.archive-it.org/7993/20170111064250/http://www.fda.gov/Drugs/InformationOnDrugs/ApprovedDrugs/ucm279174.htm. Accessed June 1, 2018. US Securities and Exchange Commission. EDGAR | co Filings. https://www.sec.gov/edgar/searchedgar/companysearch.html. Accessed May 1, 2018. Organization for Economic Cooperation and Development. Exchange rates (indicator). https://www.oecd-ilibrary.org/finance-and-investment/exchange-rates/indicator/english_037ed317-en. Accessed November 29, 2018. The World Bank. Inflation, consumer prices (annual %) | data. https://data.worldbank.org/indicator/FP.CPI.TOTL.ZG. Accessed May 20, 2018. Sertkaya A, Birkenbach A, Berlind A, Eyraud J. Examination of Clinical Trial Costs and Barriers for Drug Development. Lexington, MA: Eastern Research Group, Inc; 2011:679-715. IQVIA Institute for Human Data Science. Global oncology trends 2018. https://www.iqvia.com/institute/reports/global-oncology-trends-2018. Accessed November 29, 2018. US Department of Health and Human Services. Drugs@FDA: FDA approved drug products. https://www.accessdata.fda.gov/scripts/cder/daf/index.cfm?event=BasicSearch.process. Accessed May 1, 2018. Curagen Corporation. CuraGen and TopoTarget Initiate Phase Ib/II Clinical Trial With PXD101 and Velcade (R) for Multiple Myeloma. http://files.shareholder.com/downloads/CRGN/0x0x53329/828ef222-b03e-4c91-ab9a-82c510244d3c/. Accessed November 29, 2018. Genmab. Genmab announces phase III studies of ofatumumab in relapsing multiple sclerosis. https://ir.genmab.com/news-releases/news-release-details/genmab-announces-phase-iii-studies-ofatumumab-relapsing-multiple. Accessed November 29, 2018. United States Senate Committee on Finance. Wyden-Grassley Sovaldi Investigation finds revenue-driven pricing strategy behind $84,000 hepatitis drug. http://www.finance.senate.gov/newsroom/ranking/release/?id=3f693c73-0fc2-4a4c-ba92-562723ba5255. Accessed November 29, 2018. Chen L. The most profitable industries in 2016. https://www.forbes.com/sites/liyanchen/2015/12/21/the-most-profitable-industries-in-2016/#29c8c6ab5716. Accessed November 29, 2018. IgeaHub. Top 10 pharmaceutical therapy areas in 2017. https://igeahub.com/2017/08/22/top-10-pharmaceutical-therapy-areas-in-2017/. Accessed May 1, 2018. Bach PB. Price & value of cancer drug. https://www.mskcc.org/research-programs/health-policy-outcomes/cost-drugs. Accessed May 1, 2018. Long G. The biopharmaceutical pipeline: innovative therapies in clinical development. http://www.analysisgroup.com/uploadedfiles/content/insights/publishing/the_biopharmaceutical_pipeline_report_2017.pdf. Accessed November 29, 2018. Gyurjyan G, Thaker S, Westhues K, Zwaanstra C. Rethinking Pharma Productivity Six Triggers for Optimizing Efficiency and Costs. London, United Kingdom: McKinsey & Co; 2016.